Hiking Washington’s History reveals the stories embedded in Washington’s landscape. This trail guide narrates forty historic trails, ranging from short day hikes to three- or four-day backpacking trips over mountain passes. Every region in the state is included, from the northwesternmost tip of the continental United States at Cape Flattery to the remote Blue Mountains in the southeast. Each chapter begins with a brief overview of the region’s history followed by individual trail narratives and historical highlights. Quotes from diaries, journals, letters, and reports, as well as contemporary and historic photographs, describe sites and trails from Washington’s past. Each trail description includes a map and provides directions, so hikers can follow the historic route. Judy Bentley tells readers how to get there, what to expect, and what to look for. Despite Washington State’s rapid growth, a remarkable number of historic trails have been preserved in national parks, restored by cities and towns, returned to public use by the railroads, or opened to hikers by Native American tribes. Some trails, such as the Iron Goat Trail, have been fully restored and interpreted. Others, such as the Naches Pass Trail, have been abused but survive. Some are easily accessible, such as the Duwamish River Trail in Seattle and the Spokane House trails near Spokane. Others, such as Chief Joseph’s Summer Trail, require a half-day journey just to reach the trailhead. 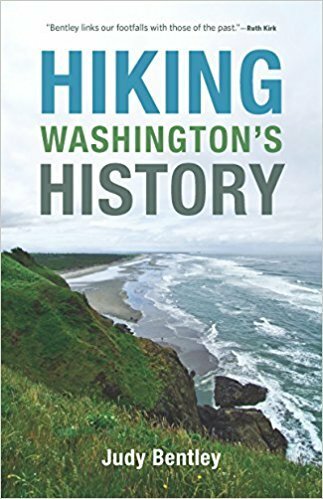 Hiking Washington’s History is for hikers, amateur historians, newcomers unfamiliar with the state's history, and Northwest natives who know only part of that history. Savor the vicarious experience of a hike from a cozy chair on a rainy winter day, or put your boots on and hit the trail when the sun shines.